Over the past few days, Deadspin and AP have published confidential financial documents pertaining to the operations of the Pittsburg Pirates, Tampa Bay Rays, Florida Marlins, Seattle Mariners and Los Angeles Angels. The leaked information, which has been verified by several teams, has provoked an angry response from several of the violated parties as well as justification for some of the underlying revelations from others. The Pirates had the strongest reaction to the leaked information, which isn’t surprising because the financial records reveal that the organization has been turning a tidy profit while receiving monumental sums of revenue sharing, not to mention languishing in last place in the weak NL Central. In addition to revealing the operating (EBITDA) and net (real profit) incomes of all five teams, the leaked documents also provided various details about several streams of revenue, including concessions, broadcast rights, post season gate receipts and revenue sharing, while offering a glimpse into some less publicized expenses like scouting and player development. 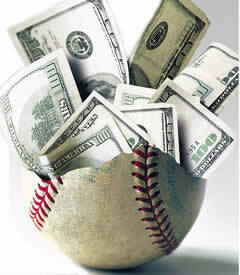 Maury Brown’s Biz of Baseball blog provides a detailed breakdown of these items, but the bottom line is clear: smaller market teams have been highly profitable thanks in large part to generous revenue sharing payouts. Of course, we already knew that. For years, Forbes has been conducting an annual analysis of baseball’s finances, so anyone familiar with that study probably didn’t even bat an eye at the findings emanating from the leaked financials. If anything, the published documents reveal that the Forbes figures overstate the profitability of smaller market teams, which you’d think would make teams like the Pirates happy. Then again, with some teams refusing to admit to any profit at all, you can see why a verifiable contradiction would be of concern. So, why is everyone making such a big deal about the leaked financials? For starters, the documents are meant to be confidential, so any breach is not only criminal, but also fosters a level of distrust between all the parties who may be privy to it (the teams, the league and the players’ association). With the current collective bargaining agreement set to expire in December 2011, any grounds for mistrust could make negotiations even more contentious, especially when you consider the looming drug testing-related regulations that the owners are likely to request. After all, the MLBPA already has a reason to distrust ownership after the revelation of several names from what was supposed to be a confidential list of positive drug tests. The fact of the matter is major league baseball, both as a league and on an individual team basis, is a hugely profitable business. The extent of those profits not only has a bearing on each team’s financial health, but also on the negotiating power of the MLBPA. One of the reasons the baseball union has become so strong is because it fully understands the value of the services its players provide. As much as owners have pleaded poverty of the years, you can’t blame the players for having a deep level of mistrust when it comes to financial facts and figures. That’s exactly why the MLBPA has shunned any attempts at a salary cap or other system that would be based on an unrealistic level of trust between with team owners. In the NFL, the players have finally realized this hard lesson (how can you tie your compensation to league revenue when you can trust the reported figures), which could send that sport careening toward a work stoppage. Without knowing the source of the leak, it wouldn’t surprise me if the motive behind it was related to the upcoming negotiations for a new CBA. Just in case there was any doubt that baseball is doing very, very well, we know have five perfect examples to dispel any claims of financial duress. And that is what has teams like the Pirates so up in arms. Part of their smokescreen has been dissipated, and any chance at forming a hard-line coalition may have been severely weakened. The bell for round one in the upcoming CBA battle has officially been rung.